The design of a new survival book from John D. McCann is in full swing. While we eagerly await the Fall 2011 release of Stay Alive! Survival Skills You Need, we thought we’d give away a couple of copies of John’s previous book, Build the Perfect Survival Kit. For your chance to win one of the books (it’s a random drawing – no merit for style, but we love to read a good story), tell us in the comments below about a time something went wrong and you wished you had an extra candy bar or bottle of water stashed nearby. Or, just say that you’d like to win a free copy of the book! And, as always, if you can’t bear to wait or risk the randomness of the drawing, visit the Gun Digest book store and order one for yourself today. Then, keep an eye out for Stay Alive! Survival Skills You Need, which begins by detailing the basic mindset (the “survivor mentality”) required to survive when things go awry during adventure, sport and travel, then goes on to explain the skills you need to stay alive. John D. McCann is author of Build the Perfect Survival Kit and founder of Survival Resources, a specialized firm offering custom survival kits and survival skills courses. Good luck in the drawing! We’ll announce the winner on Monday (June 20). Entries accepted until 10:00 a.m. Central Time Monday, June 20, 2011. Winner will be selected at random and announced Monday, June 20, 2011.
this isn’t very gripping, but I went to work the other day and wished I had something extra, for sustenance. it was a 3 hour job that stretched into a 12-hour gig, with non stops for food!! Please sign me up to win a copy. I have put together a ‘bug out bag’ and also an airplane survival kit for my boss, I’d like to see if I did it correctly or what I didn’t think of. I would love to win a free copy of the book! I would love to have a free copy of this book to share with my younger brother, who is currently deployed in the U.S. Navy. I would love to win a copy of the book Build A Perfect Survival Kit ! I would like to win a free copy of the book! I cant wait to win!!! I am always open to new defense ideas / survival Skills. The book looks to be a great reading. Would you please add me to the drawing, on Monday, June 20. Thank you. Fortunately, I have not experienced a survival situation but I do try to be prepared in the event I find myself in that situation. I read books and prepare survival kits that I keep in both my car and truck. Living in Phoenix, AZ I consider a minimum of two gallons of water in the trunk of my car as a good start in a survival kit even for in the city. When I was on the Jerry Springer show I needed a custom survival kit. I bet this book would help for next time! I have not had any serious things happen except a friend was walking on ice, we heard a noise and looked down to see him completely under the ice looking up. Since we were kids we had nothing with us, but were close to home and able to avoid hypothermia. It’s always good to be able to learn more about what to do when things happen. I was hunting a new area.I walked about 400 yds. into the woods. I sat down to watch for a bit and dozed off for a few minutes. I got up and looked around and could not get my bearings. This was the first time this had ever happened.I took out my compass and map and found the bearing I should take. As I walked back I could swear I was going the wrong way. Then I remembered reading ” THE COMPASS IS ALWAYS RIGHT”. Sure enough I came out where I was parked. Now I always remember that saying. Every year my neighbor and his family and me and mine go camping up in the Sierras. Two years ago, one of my neighbors friends went with us. Unfortunately, he got lost and it took all day searching with Rangers and helicopters to find him. After I read this book, I’m going to give it to him! I was hunting on a friend’s property for the first time, and when it got dark went to walk out. My only flashlight(which I hadn’t tested since last season) died and I couldn’t find the way back to the truck. Took two hours to get out of the woods and I felt like an idiot. I sat there thinking “what if I had to spend the night in the woods”? Not life threatening, but it was enough for me to learn my leason. Since then I always carry a survival backpack and extra light sources. One time, dad & I were going to haul some cattle and on the way, we saw one of our cows out grazing in the grader ditch. Dad stopped to let me out to drive the cow up to the pasture gate and he went up to open it with the truck and trailer. About half way to the gate, the cow decided to cross the road into an open hay meadow with open fields behind it for miles. I ran up out of the ditch and as my feet hit the gravel road, they rolled out from under me and I landed flat on my face. I ended up getting 7 stitches and had to replace a lens in my glasses that were less than 2 weeks old that got scratched. I hate it when you have drift sights and don’t have the proper tools to adjust the windage. Looking forward to reading this book, it would be a good addition to my reference collection, please enter me in the contest. When I was a teenager me and a couple buddies were exploring in the woods near our homes. They decided to take turns swinging on a vine. I thought that it was sketchy so I didn’t participate. The vine held up for a bit, but he when one of my friends was in mid swing and probably 30-40 feet off the ground it snapped, and he fell. The fall broke his leg. He also bit completely through his lip and had some other minor injuries. We had nothing. I ran to get help while other set with him. I have not went into the woods unprepared since. This would be a great book to have as a reference material and to read up on. 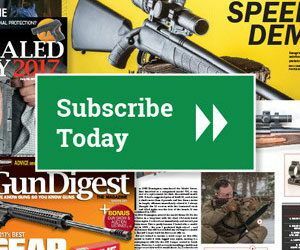 Please enter my name, and thanks Gun Digest. As far as survival, I was on a 6hr horse back ride one time and we stopped for lunch by the river in the middle of nowhere. I sat down on a log to eat my crackers and looked down to see that I was sitting a foot away from a snake! Luckily, it was early and the year and it was too sluggish to care much, but I really wished I’d had my big knife or gun with me instead of in my saddle. So I learned to keep my knife on me at all times. I came close to needing a new set of undies as well. I’d like to win a free copy of the book!